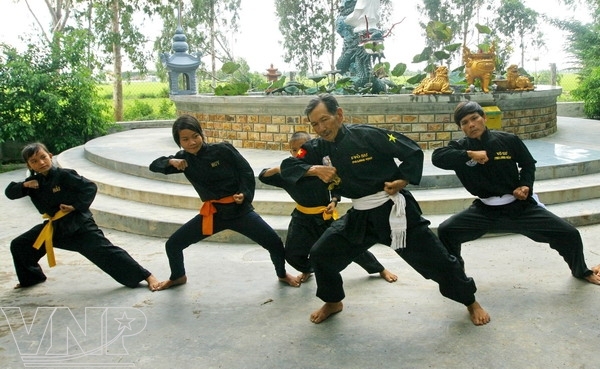 There are dozens of martial arts schools in Binh Dinh Province, but the most famous of all is the Phi Long Vinh School owned by 75-year-old Grand Master Truong Van Vinh in Phuoc Son Commune, Tuy Phuoc District, due to its unique performance "Ngoc tran than cong", one of the ten official competing performances at the Vietnam traditional martial arts tournament. It is said that the exercise was by King Quang Trung (1753 - 1792). The Phi Long Vinh Martial Arts School was found by the great grandfather of martial arts instructor Truong Van Vinh. 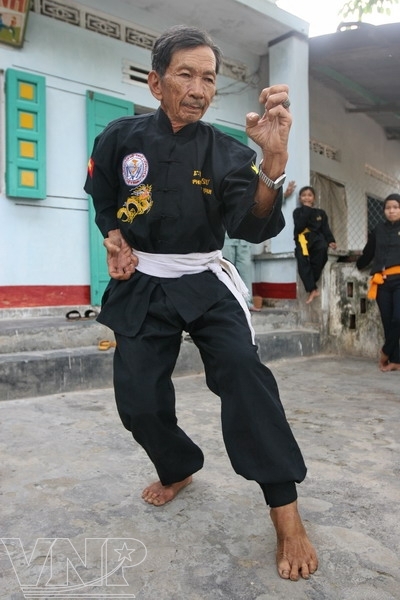 Vinh's father, Truong Van Can, is also a martial arts instructor, now 96 years old. Vinh learnt martial arts from his grandfather and father when he was nine years old, and at 18 he began performing. His whole adulthood was closely linked with martial arts competitions throughout the central and southern Vietnam. "Ngoc tran than cong" is a martial arts exercise widely popularized and instructed at martial arts schools in Vietnam, particularly in Binh Dinh Province. This composite performance has unique characteristics, including a comprehensive attack and defence, harmoniously combining powerful and gentle moves plus involves effective defensive and counterattack techniques. When moving, the performer must be very flexible and gentle, but when attacking he is very fast and strong. So far, the best performer of "Ngoc tran than cong" is martial arts instructor Truong Van Vinh. He can perform it on a mat measuring only 1.2 x 1.6m. At the International Qi Gong Tournament 2007 held in Italy, Vinh was highly praised by the foreign audience and awarded an honour certificate "Famous Grand Martial Arts Instructor Truong Van Vinh" by the Organizing Board. In 1970, during the programme to perform martial arts or compete with other famous domestic and foreign instructors, Vinh’s performance impressed the organizing board and the martial arts circle, and later he christened it the "Phi Long". Since then hundreds of martial arts disciples had been trained by Truong Van Vinh, many of them becoming famous and many martial arts schools and clubs opened and are named after Phi Long. The quintessence of traditional martial arts that Vinh had learned from his forefathers has been passed on to his sons. His third son, Truong Trong Hai, has either won or tied in the 50 events he has competed in. Hai is a capable assistant to his father in training disciples at Phi Long schools. His 8th son, Truong Trong Hung, now 32 years old, has so far had 40 competitions. Truong Van Vinh was awarded many medals and certificates, but he is never satisfied. “Martial arts are needed, like air for breathing. The disciples have to train hard and continuously to be successful," he said. Despite his old age Vinh continues to farm along with teaching martial arts to children in his free time. To him, Phi Long Vinh Martial Arts School is truly his home. 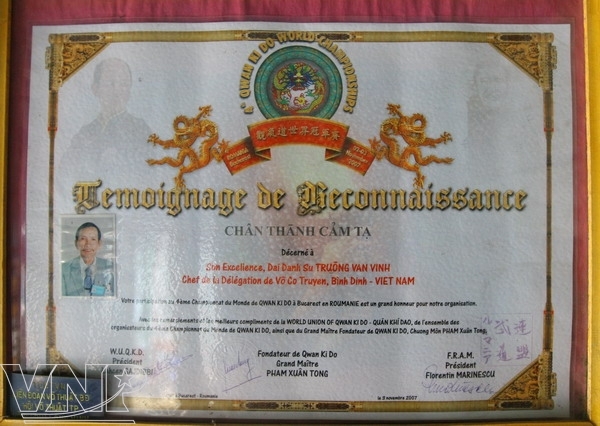 The certificate awarded by the Italian Government to martial arts Truong Van Vinh. 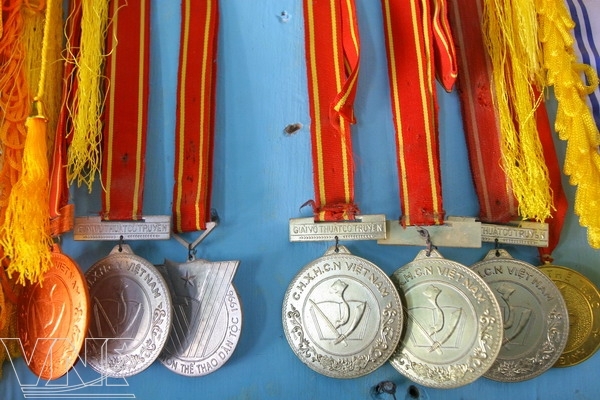 A set of medals won by Phi Long Vinh martial arts disciples. The attack with an elbow and head pushing is such a dangerous move that the rival can not defend from it. Truong Van Vinh in a posture of the tiger fight. A direct fight between two Phi Long Vinh disciples. 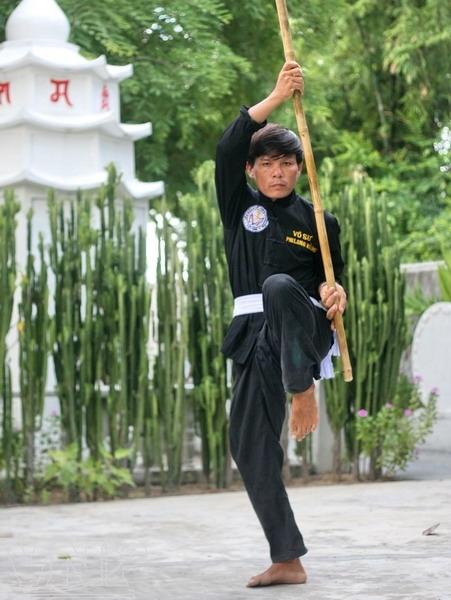 Performing a Phi Long Vinh martial arts move with a long stick. Truong Van Vinh instructs his disciples on a standing position. A close counter-attack by locking the rival’s feet.